WingerBLOG: 20150426 + 1st Championship! 20150426 + Up in the am and all to church. Home for lunch and got a little bit done. Then L took J to his buddy Conor's so he didn't have to sit through baseball. LDG&I headed to Grove City for the last day of the tournament and the semifinal game. Gma&paW came down for the action. The boys delivered and we won't the first game :-) we waited a bit and then game 2. 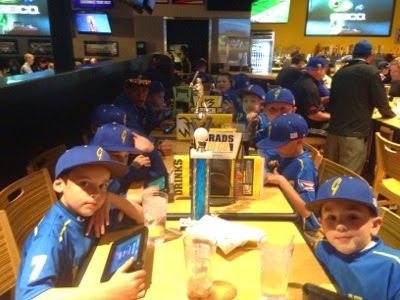 The boys stepped up and run ruled the Olentangy Stix (GREAT LITTLE TEAM!) in 5 inning, (12-1)! There was a nice trophy presentation and then the team headed back to our turf for some grub at BWs.